Helping People Help Animals Since 2004! We have the most wonderful clients! Scroll down to read many more stories. Scroll all the way down for wounds and infections. We have included the wounds and infections separately as to refrain from shocking anyone, some of the photos are gross, but all healed beautifully! You must scroll toward the bottom of the page to see them. 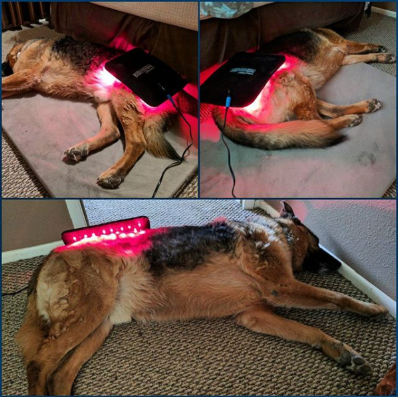 I am so glad I saw an ad for this light therapy system by Equine_Canine Light Therapy in Animal Wellness Magazine recently. I purchased it right away and it arrived just a few days after I placed the order. I’ve been using it on Jimmy for about a week to reduce arthritis related pain and inflammation in his joints and degenerative changes in his spine that are causing lower backpain. 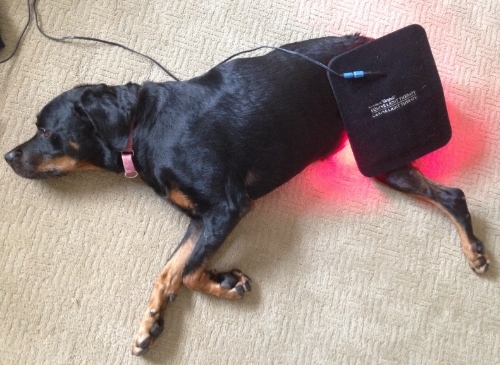 The light therapy system is so easy to use and I love that it is a non-invasive way to treat his joints and back. I had originally planned on taking Jimmy to see a therapist to have basically the exact same type of treatment rendered, but being able to have therapy sessions at home where Jimmy is most comfortable is the ideal situation. I wish I had found this therapy system years ago, but better late than never 🙏. My dog suffered a bone spur in his neck and had to be put on Tramadol and Prednisone for over a year which was not helping one bit. One day I saw this product and decided to buy it. It said in the directions that it may not work as well with the dog on certain meds. So my vet had recommended that we get my dog surgery to his neck. That scared me to death. So I asked him if I could stop giving my dog his meds so I could try this light therapy. He said I sure could. I did the 15 minute treatments two times day for 90 days and to this very day my dog no longer hurts. He would fall asleep every time. He liked it. He is 10 years old now. and doing great! Thanks to "Gospel"..Equine Light Therapy. Also used it on my horse when he got a stone bruise on his foot, used it twice a day for 30 days and was healed. I adopted Scout at 18 months old, this April he'll be approximately 12 years old. His activity level has slowed some and he is now showing signs of hind end weakness, so I've increased Scout's light therapy to morning and night with use along his spine. As you can see he doesn't mind one bit. 😌 I definitely and highly recommend According to "Gospel" Equine and Canine Light Therapy pads. Auto shut off after 15 minutes, easy to clean and use and YES, I saw an immediate difference even after 15 minutes. I'm now using it with my other GSD. Amazing! LOVE, LOVE their light therapy pad and always recommending it to friends and family. "Dawson is a five pound, approx 13 year old toy poodle, rescued from a puppymiller about four years ago. He has luxating patellas and an ACL injury, but is not a candidate for surgery. We use the light daily on him and it has made such a difference, especially in combination with his acupuncture and massage therapies. At one time, he wasn't using his right rear leg consistently and now he is. Almost 7 yr old Beagle cross Sophie with hip dysplasia. Someone is loving her twice a day light therapy sessions! Seeing improvement... Stiffness is shorter in the morning, walking better and starting to use all 4 legs going down stairs instead of flying down them on 3! And we're just starting day 5! "Thank you so much for this product!! My 9 yr old golden seems to really enjoy it and I have noticed a big difference. I love it too! It does work. She even smiles when I put it on her. I tried it on my knees after working in a hospital for long hours and they feel great too, most importantly Maggy really enjoys it and seems to have relief from her pain. Thank you again for such a great product that is amazing and the customer service was awesome!" HUGE thank you for your wonderful product. One of our whippets, Phargus, got a huge hematoma on the interior of his front leg Monday in our yard (trying to catch a squirrel). Three daily treatments of 10 minutes each has shown phenomenal progress ... photos are of 1 hour after the injury, 1 day after, and tonight, a mere 4 days later! I bought small pad for my dobe who has wobblers. The disease is progressing and she was falling a lot more frequently. After a week and half of using the light pad twice a day she has been much more steady on her feet and not falling as much. Here's Dani getting her light therapy. Thanks so much it really does help her. Hi, I am a canine massage therapist. This is one of my clients after cruciate surgery. I have seen fantastic results in using my light pad. Shelby is an almost 11-year old Rottweiler, who we adopted when she was two years old. She was a stray dog and had stepped into an animal trap; as a result of this, she lost her right hind leg. Over all these years Shelby never had an issue with her disability and was always able to keep up with our other dogs and us. However, 1 ½ years ago Shelby didn’t want to go up the stairs anymore, and when she tried on her own, she whined. We took her to the vet, and the vet suspected a strain in the Iliopsoas muscles. She mentioned to us that this is a long process to heal with lots of rest; for 4-legged dogs, it can take a couple of months to heal. She wasn’t sure how long it could take for Shelby since she never can take pressure off her hind leg. The vet recommended crate rest and further check-ins every month. As soon as we took Shelby home, we used the Canine Light Therapy pad on her twice a day. We put it on the inside of her leg and also on the outside of her hind leg. After a month of treatment and the first check-up, the vet noticed already a remarkable difference and after just six weeks of the diagnosis, Shelby was able to go back on walks. We still carried her up the stairs and didn’t allow her to jump up on things just to be on the cautious side. Shelby enjoying her Canine Light Therapy treatment! Every so often, she hesitates to go up the stairs, and when I notice it, I immediately apply the Canine Light Therapy pad on her “ham” (that is what we call her hind leg) until she wants to go up the stairs on her own again. I truly believe if we didn’t have the Canine Light Therapy pad, Shelby would be on regular painkillers by now and who knows whether we would have been able to heal her strained injury completely. As a matter of fact, when people see her on her daily walks, nobody guesses her age correctly. Rosie always does her light pad therapy with her favorite stuffie in tow. She just loves this part of the day! 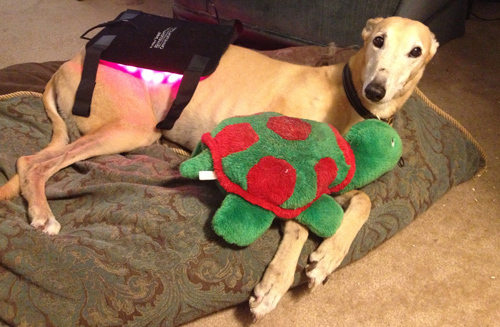 Rosie, an 11 year old ex-racing greyhound, loves her light pad therapy. When she was 10, she fell through some stairs and injured her back badly. The vet was very worried and did not think she would be able to walk very well after the injury, but encouraged us to look for alternative ways to help Rosie with her issues. We turned to Equine and Canine Light Therapy because we've seen such wonderful results on several of our friends' horses. After a few weeks using the light therapy pad, coupled with pain meds, Rosie has made substantial progress in mending her back. She loves her walks, can jump up on the bed again, and although she still has trouble with her back on occasion, has barely changed her lifestyle at all. I truly believe that without the light pad therapy, Rosie would not be walking today. She asks for it, I swear! I bought the medium sized pad at the Houston World Series of Dog Shows. I've been using it on my dog who has IMPA ( immune-mediated polyarthritis). She is moving better, and most dramatic, she has gotten off my bed unaided at least 3 times in these last two weeks. It has been months since that has happened, except maybe the day after we see our vet chiropractor. Today Candy had her regular appointment at the vet chiro. I brought the pad to show off and Dr. Robin already knew about it. She found Candy much looser, and her head and neck were in much better alignment than usual. Candy asks for the light pad at times, but she also tells me when she’s had enough. She is so smart! Our vet chiro, is very pleased with Candy's progress since we've been using the light. Now to be fair and honest, I have to admit we're also doing core exercises, but the combination is working synergistically. Candy is so much better and happier! She may not want to walk farther - it is Houston and therefore, very humid! But she is happier and moves so much better. I am so very thankful that we met and that light therapy is now a part of our daily routine. And the best is the intangible -- she's happier. Thank you, from both of us! I have been doing agility for about 10 years. In 2011 I bought my 1st "According to Gospel" light pad, I started treating my dogs every night before they ran agility. One thing that I noticed after using the light pad was that they were a lot easier to stretch out and their flexibility was greatly increased. This produced faster times due to tighter times. I also noticed their recovery time between runs was better and injuries healed faster. I stand by this product 100% to the point where I have even bought an additional pad and recommended the product to friends and clients all of whom are very happy with the product. I know it works from what I see with my dogs, but I have used it on myself to great results. I had plantar fasciitis to the point where I could hardly bear weight, especially in the morning. I used the light pad and the pain is gone. I have used it on my chronic bad knees, back, and wrist. It works! I can't say enough great things about this company. When my original pad shorted out 5 years after I had purchased it they replaced it free of charge and sent me a loaner pad in the meantime. Recently, my 10.5 year old Border Collie placed 3rd at the AKC Nationals. He had a pretty bad slip in the finals that caused him to come up lame after it stiffened up. I used the battery pack with the light pad and he was able to walk to get his awards. This is a great product. I truly stand behind it because it works. If used as a prevention it will keep you and your dogs sound. If used after an injury it will shorten the recovery time. Katie is a Labrador Retriever who was rescued from New Orleans following hurricane Katrina. She recently suffered medical problems that cause her to have joint pain and she is losing her vision. 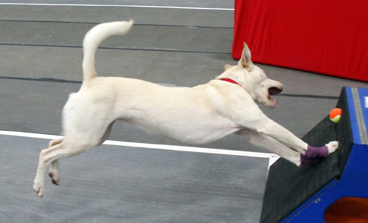 She is an all around athlete who enjoys agility, dock diving, and flyball. Katie continues to play flyball with her teammates on the Queen City Road Runners flyball club. Her pain is managed using light therapy. 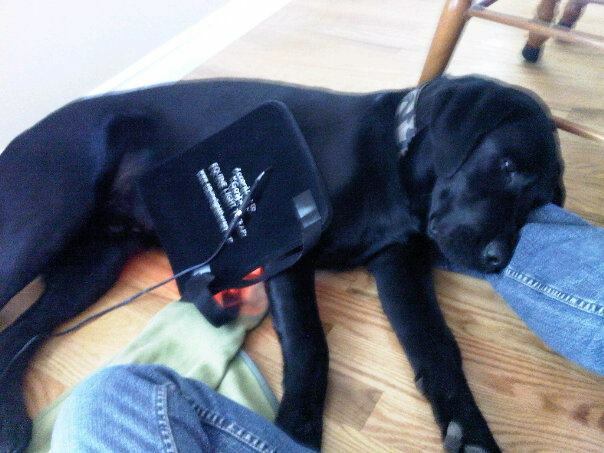 I use the Canine Light Therapy pad each evening after racing with great results. Light Therapy keeps fly ball dog in top performance. Rodeo and I were introduced to Canine Light Therapy pads by a friend when I began to notice his soreness in the wrists during flyball weekends as he has aged. She began helping me use the pad around his forelegs and then do some light massage and stretching. Rodeo settled right down into the routine and we began to move to his shoulders and back. The response was amazing. It relieved his soreness and there was less fatigue the next day when it was back to the lanes. I had to have a pad of my own to make this routine a part of his regular care both on and off the lanes. Any soreness from overuse is quickly taken care of and has also been used after minor procedures to help heal at a quicker pace. We will not be without one. My second dog, Cedar, is now beginning to receive it as well for preventative care. I've used it on myself and can say confidently that this product works! Bossly pulled all the muscles in his shoulder when he and a pit bull played too hard. The vet was amazed at how well he healed and how fast. 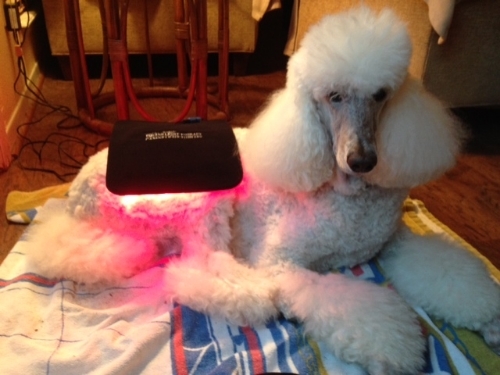 I used the Canine Light therapy pad for two weeks, twice a day for 15 minutes. Barbara was attacked and seriously injured by an animal unknown to us. Her left side was seriously wounded with punctures wounds to front and rear left legs and face. The veterinarian kept her for a few days before I brought her home. Her rear left leg was injured, but she had begun to use it some when I picked her up. However, she had no use of her front left leg, and it was uncertain if she would ever regain use of it. After one week of having her home, she still showed no use or any attempt to use her front left leg. It was dead weight she was carrying around. Every day I would tug at it, and prod my finger in her paw as to elicit a response as it did in her good front leg, but to no avail. That's when I called you and ordered a light pad. After getting the LED light pad in the mail, I began administering it to Barbara twice daily. After two days of the therapy, my prodding of her left front paw elicited her pushing back on my finger and extracting her claws as to grab hold of my finger. The fourth day of therapy, I found her pawing at an insect on the floor with the injured leg. And after a week of therapy, she began to exert weight on the foot while walking, doing so with a limp. I continued the therapy for another four weeks. Fast forward to today…Barbara has full use of her rear and front left legs, walking, running, and jumping freely. Her front left leg seems to have somewhat of slight hitch in it, pushing outward a little more than her right knee when she walks, somewhat like a John Wayne swagger. But she has full use of it and seems just fine. I’m convinced the light therapy healed her leg, or at least accelerated the healing process. On Thanksgiving weekend, 2007, Basheera, a 3 1/2-yr-old saluki, was running for field at a lure coursing trial. She is a proven and talented courser but that day she had an unfortunate and, thankfully, uncommon accident. The coursing line wrapped around her left hind leg as she was running and severed her achilles tendon, leaving her severely injured. She was rushed to an orthopedic vet who is well versed in working with sighthounds and athletic injuries. After surgery, she was put in hard casts for seven weeks and then soft casts for several weeks afterwards. Her bedrest was almost total. When the casts were finally removed, Basheera was in imminent danger of re injuring the now seriously weakened and still painful leg. Her leg seemed to be nothing more than a feather. The once strong, defined muscles were gone and what was left was a shell of her former strength. Basheera started massage therapy with a Chiropractic Veterinarian even while the hard cast was still on. The veterinarian, after seeing the extent of the injury and the need for mindful rehabilitation, recommended using the Equine Light Therapy Pad once the casts were off. She said the recoup period would be greatly reduced by wrapping the pad around the injured leg twice a day, 10 minutes per session. After Basheera returned home from two weeks of rehab at Auburn University, the Equine Light Therapy pad was used per our vet's advice. Basheera's rehabilitation has been a miracle but sometimes miracles appreciate help. Her muscle mass has developed rapidly and continues to improve on what seems to be daily. With the use of the Equine Light Therapy pad, massage, and a careful exercise program, Basheera has shown dramatic improvement, more so than her owners had hoped for. The owners were told that Basheera would always have a limp and not be able to run and play. She has almost no discernible limp and does run and play. Our veterinarian also recommended using the Equine Light Therapy pad on Basheera's back to keep her spine more flexible. She is not suffering from inflexibility, which is amazing. As Basheera's owner and guardian, would I recommend the Equine Light Therapy pad? Without question! August 2009: I was looking for lights for my dog, so after hours searching on internet I found your products. I think Gospel's is a better choice for Kella, I hope this can help Kella, I want to give her better days as a senior dog. They don't make or sell such infrared light products here in Norway and people in this country haven't heard about this from doctors and the news. Now I hope also Norwegian animals can be treated with your lights. September 11, 2009: Kella had her first treatment yesterday and she seems to love it, she lies flat and does not move, I think she really enjoys the treatment. I hope this will help her back and stiffness, but I guess it takes time to see a difference. Kella was X-ray last week south in Norway, she has a prolapsed disc in her lower back so I will give her light in this area two times daily. Tonight Kella and I went up on the hill to find some blueberries and for the first time could I see she is walking better. Kella is still weak, but something had changed with the lameness in her back legs, she could clearly lift both legs tonight. That is amazing, if she continues to recover so fast she will be able to get a better life as a senior dog. October 4, 2009: Kella is clearly better walking now and she can climb stairs again. When she lays flat on the floor she is coming up on her feet as soon as she did before she got the prolapsed disc, which is really amazing for us to see. Our vet said Kella would never be able to walk on her own feet again and she recommended euthanasia, well, the vet almost tried force me to accept euthanasia. I told her that I would give Kella a new chance and I am so glad I did. I have been to another vet (will never again go back to the first) where Kella got acupuncture for strengthening the immune system. The new vet says Kella looks curious and happy with fine movements. Now I use the pads one time almost daily on her back and it seems that is enough. I also use the pads on her liver, shoulders and hips. Kella had too high levels in the liver and also this is fine now. Sure this is from above, God always listens to our prayers and he led us to your Gospel's miracle lights. Warning! The stories below contain before and after photos of wounds, some are pretty extreme. All were able to heal dramatically with the use of our Light Therapy pads. Please stop scrolling here if you do not wish to see them. I purchased a large light for my horse a while back…And it has helped his arthritis. I am now using it on my Old English Sheepdog who got a very bad infected tick bite which spread into a very difficult MRSA staph infection which we have been struggling to treat for almost 8 months due to an underlying autoimmune disorder. Within 3 days of starting the light therapy the wounds that would not close for 8 months began to close. I wouldn’t have believed it if I hadn’t been through thousands of dollars in vet bills and two different vets…and we were running out of options. I have also passed along to my vet, how this has really helped my dog turn the corner on that difficult infection. He is going to recommend it to his other patients. In 2009, Joggi, an 18 year old Warmblood cross, fell and badly injured his stifles. 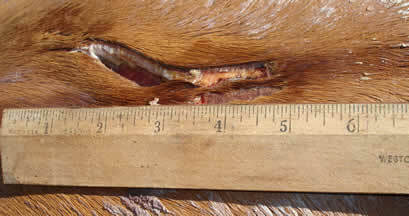 The injury was so severe that the stifle joint was visible on the left side. A veterinarian treated the injuries but could not close the stifle wounds with sutures, the biggest danger feared was infection in the joints. The hole in his left stifle was large enough to insert 4 fingers, about 4 inches deep. A daily regiment of flushing and packing the wound was started by the barn staff. Light Therapy treatment was added the morning after the accident for 10 minutes per area twice a day with According to “Gospel”… Equine Light Therapy Pads. Joggi was in a great deal of pain and was being given 4 grams of bute per day. Even with the bute, he was reluctant to walk forward or bear weight on his leg. When we arrived at the barn on the fourth day, the barn manager told us he was walking so much better, they had cut his dosage in half. Wounds are almost closed in one month. Equine Light Therapy heals wounds fast! Two weeks after his injury, the healing was dramatic, it still looked bad, but the tissue that was forming was healthy and pink and the swelling was reduced. One month after his accident, the hole that you could insert all four fingers into was a fraction of the diameter and half the depth. We also used the light pad on the side of the stifle so we would not close the hole and leave a pocket inside. Everyone was very pleased with how fast and cleanly Joggi healed, no proud flesh and his hair even came back in his natural color, not white. With only a slight scar as a reminder of his injury, Joggi is back to work, jumping courses like the pro he is! Bailey, an older sweetie, had a fatty tumor in her groin area that got infected and burst, leaving a hole that would not heal. 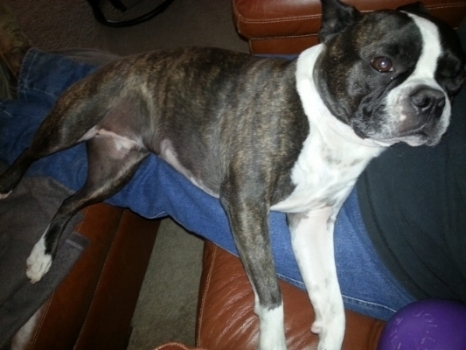 Her owner contacted us to see if light therapy would help. You can see the results using the Small Light Therapy pad for only 3 weeks! Her owner began treating Bailey on August 8th! The final photo is August 27th! She wrote, "You certainly helped Bailey out a whole lot! Thank you again so much....this old dog is happy again and chasing squirrels!! That's why we do it!! Older dog with debilitating infected fatty tumor. 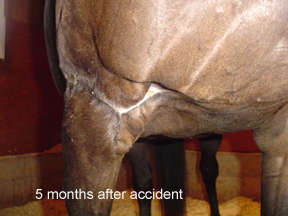 Our horse Dancer was hit by a car on March 25, 2006, the wound was quite severe and tore the muscle to the bone. I thankfully had a therapist with me that had one of your Equine Light Therapy pads and we began using it immediately on the wound. Dancer was given about a 20% chance of walking and the proud flesh was to be extensive. I am convinced that because of your Equine Light Therapy pad and Figerola suspensory supplement, she lost no skin at the sight, and no proud flesh appeared. It was no less than a miracle and I thank you for your product. I am sending you pictures at 16 days, 3 months, 5 months and on January 27, (10 months after the accident) Dancer is in the ring working on strengthening her muscles. Massive wound to horse right front leg. Wound closed, leg functional again by using Equine Light Therapy. Healed with Equine Light Therapy; no scar or white hair. The statements and the products shown on this website are not intended to diagnose, treat, cure or prevent any disease. Our products should never be used in place of veterinary care. Those seeking treatment for a specific concern should consult a qualified veterinarian prior to using our products if possible.